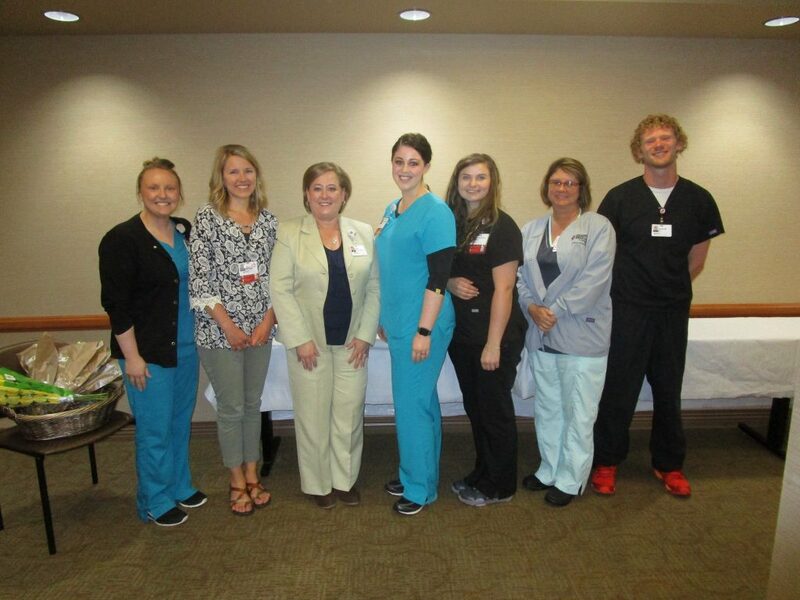 While fields of daisies are a common sight in East Tennessee this time of year, a different kind of daisy has become a regular part of the nursing program at Fort Sanders Regional Medical Center in the past year. The DAISY Award is bestowed on nurses who make a big difference in the lives of others to offer compassionate, skilled care in a way that is particularly outstanding. The DAISY award is part of a national program to honor the life of J. Patrick Barnes recognizing nursing excellence, and was launched at Fort Sanders Regional in April 2017. One winner is selected each month by a committee of nurses. Other Covenant Health hospitals also participate in The DAISY Award program. Holly was nominated by a former patient who was unexpectedly hospitalized in the week leading up to her daughter’s wedding. The patient was informed she would be unable to attend the ceremony, so hospital staff made arrangements with the family to pull together a wedding ceremony in the hospital’s chapel. Holly went out of her way to bake the couple’s wedding cake and delivered it on her day off. Ashlyn was nominated by a fellow coworker for going “above and beyond” to help a non-English-speaking patient and her family. Ashlyn was dedicated to helping the patient understand and manage a newly diagnosed condition even after the patient was discharged. Amanda was recognized by both the patient and his spouse for delivering “incredible care.” They noted that Amanda always took the time to explain everything she was doing and always had a smile on her face. Nursery staff member Christal was nominated by a patient for delivering outstanding care to her newborn during her stay at Fort Sanders Regional. Christal was very proactive and kept the new mom up to date on everything happening with the baby until she was able to go home. Nursery staff member Savannah was nominated by a patient for providing compassionate care after the birth of her child. Savannah supported the patient as she faced issues with breastfeeding by offering advice and encouragement. Emergency nurse Alex was nominated for The DAISY Award by a patient’s family for taking care of their loved one after an unexpected accident. They noted that Alex acted as an example of how all nurses should treat their patients. After a difficult pre-term delivery, the patient was thankful for the genuine compassion and empathy labor and delivery nurse Allie showed her. Not only did Allie attend to the patient’s medical needs, but she provided emotional support for the patient and her family. Brandy, a shift leader in Fort Sanders Regional’s Transitional Care Unit, was nominated by a patient who says she demonstrated exceptional care. When the patient began to experience complications, Brandy treated her with calm urgency and offered comfort until the situation was resolved. Mary was nominated by a patient’s nephew for demonstrating exceptional nursing care to his aunt. He stated that Mary helped brighten an otherwise dark chapter in the patient’s life through her compassion and smile. Belinda was nominated by a patient for providing exceptional care. On one particular day, the patient grew restless lying in his hospital bed and Belinda offered to take him on a walk to enjoy the sunshine. The patient said he will always remember her kindness and treasure that memory. Learn more about Fort Sanders Regional Medical Center’s DAISY Award winners at fsregional.com/daisy.